054. DISCOVERY II. Issued by R. & J. Hill Ltd. (1940). Card number 13 from a set of 50 entitled "Famous Ships". Size: Ca. 2.5" x 1.5". Recto: View of Discovery without sails set in icy waters. At bottom: DISCOVERY II. Verso: FAMOUS SHIPS | No. 13 | THE "DISCOVERY." 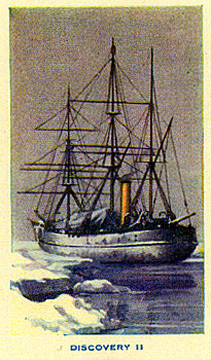 | The Discovery, sixth of her line, carried Captain R. F. Scott's expedition to the Antarctic in 1901, and helped to unlock Polar secrets. The vessel, specially built at Dundee, was 172-feet long, 33-feet in beam, and had a registered tonnage of 475-485. She was frozen in for two winters, and when almost abandoned, managed to free herself, to return home in 1904.